How To Correctly And Easily Ready-boost a USB or Flash Drive With Video? 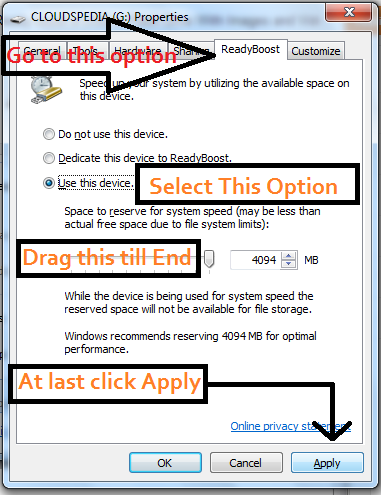 If your PC is slow or becomes lazy sometimes when you try to run or install a software or games by which your system get like hanged. Then don’t worry we are here to help you every time. There is a way by which you can speed up your system without any software. By using USB/Flash Drive (Universal Serial Bus). By ready boosting you can speed up your system. It depends on the capacity of your USB/Flash Drive. I recommend you to use more than a 2 GB USB because a USB/Flash Drive can be ready-boosted maximum as the maximum you can ready-boost is 4.0 GB. 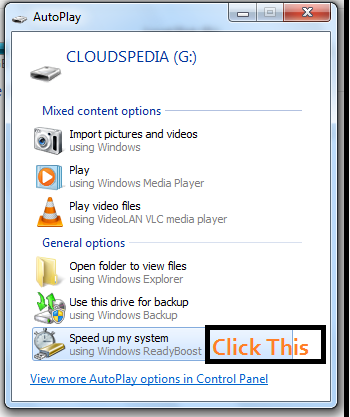 So, below I am sharing “How you can correctly and Easily Ready-boost a USB or Flash Drive with Video”! Plug in your USB/Flash Drive in one of your system USB ports. After Plugging an window will open as shown below. 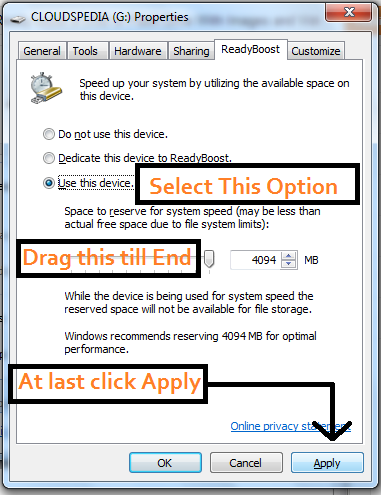 4.After clicking Speed up my system follow the steps shown in the image below. 5.And You Have Done ! 2. And You Are Done! Watch Video? Don't Worry We Are Here Watch The Video Tutorial In Your favorite Site ! I hope this article will be helpful to you kindly remember me in your prayers and also comment about our first PC Trick. Thanks For it. Very nice post. Mr.Shiraz good work gone. Keep it up.